I like to end the summer with a festive, theme inspired barbecue. This year I decided to have a Labor Day Luau Party. Adding a Hawaiian theme creates instant fun to any event. 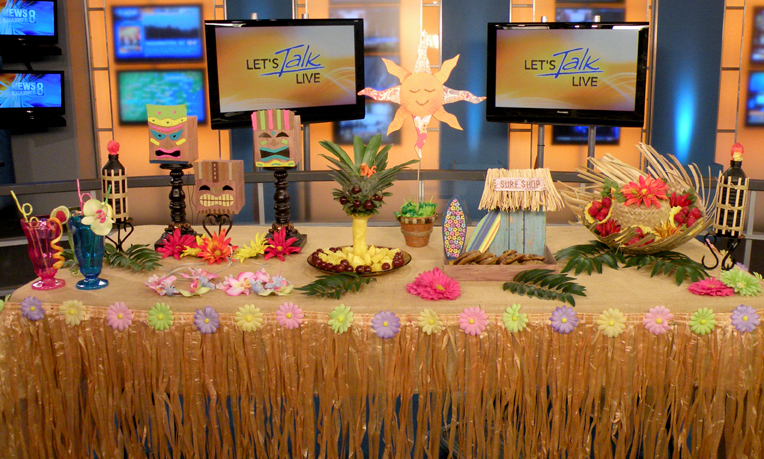 I had a great time creating inexpensive luau decorations from household stuff and items found at a local craft store. Here is a a video of me showing my designs on Let’s Talk Live in Washington DC. This entry was posted in Crafts, Everything, Food, Media, Recycle, Uncategorized and tagged Gina Tepper, Hawaii (island) Beach, Island Maui Hawaiian, Labor Day Hawaii, Lei, palm leaves, Pineapple Palm Tree, Sun Decoration, Surf Shop, Tiki, Tiki Faces, Tiki Torches, Tropical Drinks, Tropical Garnishes. Bookmark the permalink.